I first must let everyone know that I have been getting tons of e-mail from a lot of different people thinking my engine is a Challenger, or a Challenger hybrid of some type. I have had questions about how I did the Hemi head conversion for the Challenger engine. Sorry, guys. This engine has nothing to do with the Challenger V8s. 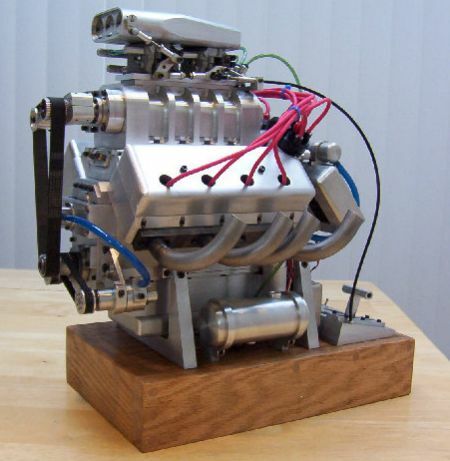 It is not based on any type of scaled down full size engine. No castings were used in this engine. This engine was constructed based on ideas I thought would look neat and be fun to machine. I do like the Challenger engines but I wanted to do something a little different. I could go on and on about this marvel, but if you’ve got a few minutes, visit the site linked below; it contains hundreds of photos of the engine and its parts in various stages of disassembly as well as a tour of the maker’s shop and pictures of the tools he used to complete the project. I’m glad you guys decided to use this. I am in sheer awe of the man who created this thing. The skill and determination it took to make this is just amazing to me. Now bolt up a cvt and put on the back of a street luge board. Best way to commit suicide ever. Reminds me of that 1/3 scale ferrari, that thing was even more amazing. hello ther, just gr8 that v8! !can you tell me where can i get some info,how to build a model similar like that?